leads The People’s Celebration of Shakespeare’s 450th Birthday – 25th and 26th April 2014. The town that gave the world William Shakespeare is celebrating his 450th birthday with a special guest appearance from a ‘larger than life’ representation of another famous historical Midlands figure – Lady Godiva. To coincide with the birthday celebrations, Stratford-upon-Avon will give sanctuary to Coventry’s most famous daughter in the form of an extraordinary six-metre tall moving marionette. The giant feat of engineering, created by Imagineer Productions for The Cultural Olympiad in 2012, will start a weekend of local community celebrations arriving in Stratford to launch her own Regional Odyssey on 25th April. According to legend, Godiva was an 11th Century noblewoman who rode naked through the streets of Coventry as a protest over the high taxes imposed by her husband, the Earl of Mercia. 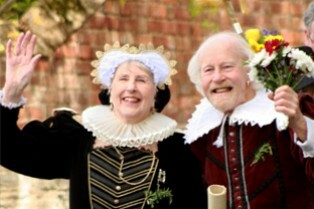 Supported by Shakespeare Birthplace Trust and the Royal Shakespeare Company (RSC), the fully-clothed Godiva will spend a night at the home of Stratford’s famous son in Henley Street before leading the biggest ever community celebration the town has seen – The Peoples Pageant – on 26th April – as part of Shakespeare’s birthday celebrations. The People’s Pageant complements the flag unfurling ceremony and main birthday ‘cradle to grave’ procession through the town of Brass bands, civic dignitaries, foreign diplomats and pupils from local schools, each carrying their floral tribute to lay on Shakespeare’s grave in Holy Trinity Church where Shakespeare in buried. Godiva represented the creative heart of the country during the 2012 Cultural Olympiad and Imagineer Productions has spent the last 18 months working on a series of appearances throughout the Midlands in 2014. Her visit to Stratford-upon-Avon, Godiva’s first outing on this tour, centres around her collecting stories of Shakespeare and in particular the women in his life and in his works. “There is a natural symbiosis between Godiva’s Odyssey and Shakespeare’s birthday celebrations – both were famous historic characters from the Midlands whose legends live on in our imaginations,” said Marion Morgan of Stratford Birthplace Trust and co-ordinator of the People’s Pageant. “Godiva was a strong and principled character, the kind that Shakespeare wrote about, and the Shakespeare Birthplace Trust’s five properties – Shakespeare’s Birthplace, Nash’s House, Halls Croft, Anne Hathaway’s Cottage & Gardens and Mary Arden’s Farm – all have strong associations with the women in his life,” she added. The RSC has recently launched The Roaring Girls – a series of productions led by Deputy Artistic Director, Erica Whyman, including two rarely performed Jacobethan plays which reveal some of the great parts written for and about women. The first play in the series, The Roaring Girl, previews from 9 April in the Swan Theatre. Entertainers from around the country and overseas will perform throughout the day, filling the streets of Stratford and drawing visitors to the town from all over the world. Godiva will spend the afternoon in Bancroft Gardens, forming the focal point for the day-long celebrations. Here Godiva will meet her future lifelong companion, The Humming Bird, for the first time. This exquisite mechanical bird, capable of flying one and a half kilometres, will appear and make its inaugural flight in a premier outdoor performance created by Imagineer. Local people are invited to be a tourist in their own town and visit the Shakespeare Family Homes where they can get free entrance with proof of a CV37 address to celebrate the milestone anniversary. Free performances in the town centre throughout the day include an American choir singing in the gardens of Shakespeare’s Birthplace, live theatre, the Poetry Doctor, renaissance dance troups, traditional dance and music, student performers from the USA, Russia, Spain and around the UK and family activities at all five Shakespeare Birthplace Trust properties and at the RSC.